The Guernsey Hedgehog Rescue Centre is a charity dedicated to rescuing orphaned, injured or sick hedgehogs. 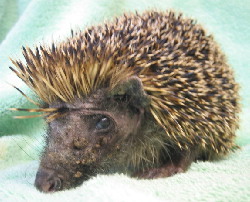 Our aim is to help any hedgehog, whatever its condition, and when healthy to release it back into the wild. We pledge not to give up on any hedgehog that arrives on our doorstep. For more details about the centre see the About the Centre page.